Raw Banana in a kofta?? Yes it tastes equally good as other kofta’s like potato, paneer etc. 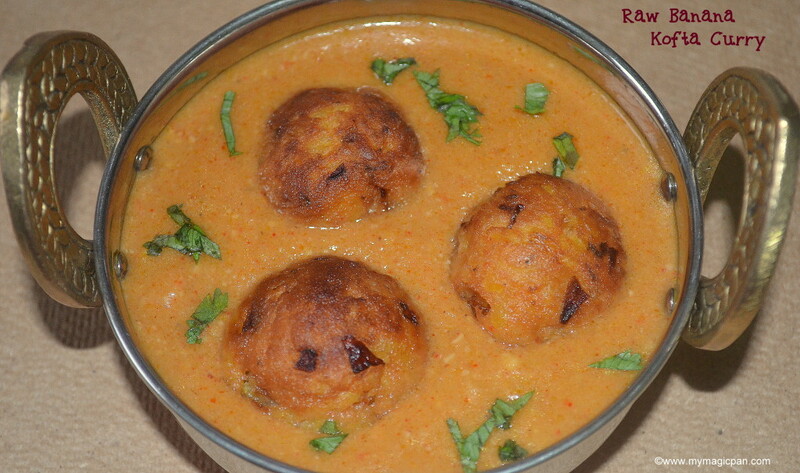 Raw Banana Kofta Curry is a sumptuous gravy recipe for roti, naan or pulav varieties. 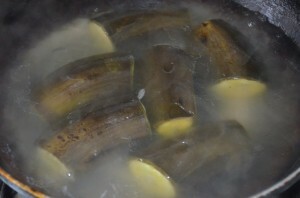 Usually recipes with raw banana are quite limited. 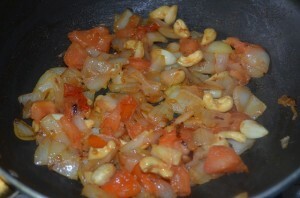 I normally end up making the most common poriyal or stir fry. This is the best recipe with Raw Banana. U can serve these koftas as a snack by itself or dunk it in a rich creamy gravy and serve as a side dish. This Raw Banana Kofta Curry recipe is for a special monthly event called “Shhhhh Cooking Secretly Challenge”conducted by Priya. I am so glad to be paired with Sujatha this month. 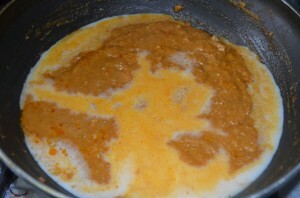 The secret ingredients she gave me were Raw Banana & Spinach and I used Raw Banana to make this Raw Banana Kofta Curry. Thanks to u Sujatha!!! Wash & trim the head & tail of raw bananas. 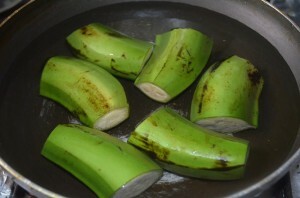 Heat a pan with water and cook the raw bananas until soft. They will change color. This will take 5-7 mins. Once cooked peel the skin and keep it aside. 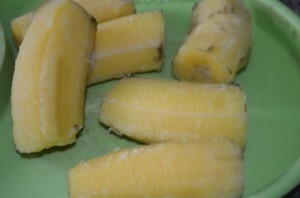 Grate the cooked raw bananas. 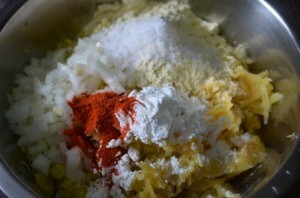 To this add besan, corn flour, salt, chilli powder & finely chopped onions. Mix together with your hands to form a dough. Do not add any water. 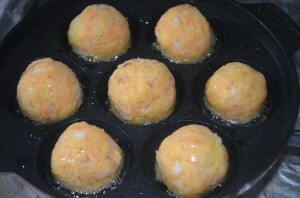 Make small balls from the raw banana dough. 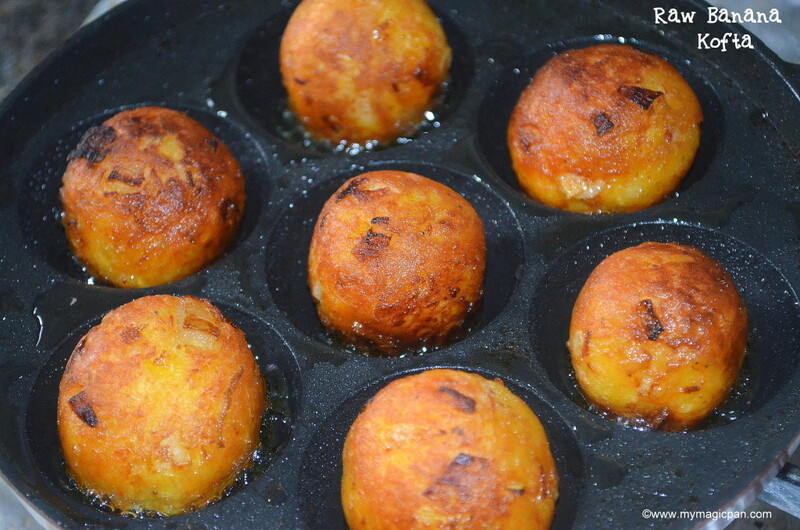 Heat a paniyaram pan and fill each hole with oil. 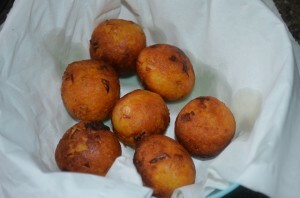 Place the raw banana balls in them and cook in low-medium flame until golden brown turning them on all sides. Drain them in paper towels. Raw Banana Kofta is ready. Keep it aside. Meanwhile lets get ready with the gravy. 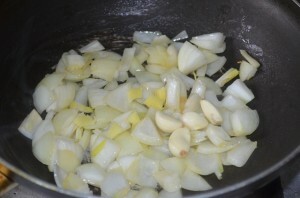 Heat a pan with oil and saute roughly chopped onions, garlic pods & ginger until onions are transparent. 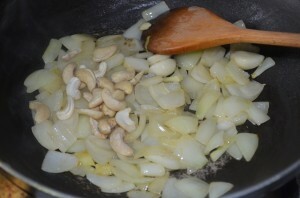 To this add cashews and saute for a few seconds. Finally add chopped tomatoes and saute. Switch off the flame when the tomatoes get mushy. Let it cool and grind it into a smooth paste. In the same pan heat oil and add the ground paste. 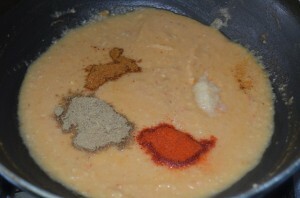 To this add salt, chilli powder, coriander powder & garam masala. Mix well. 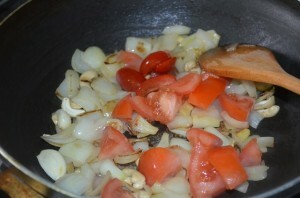 Cook the onion tomato gravy in low-medium flame until oil oozes out. 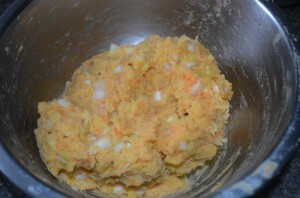 To this add boiled & cooled milk and mix well. Do not boil the mixture for a long time after adding milk. Switch off the flame. Gravy is ready. Add the Raw Banana Koftas to the gravy. Keep the koftas & gravy ready separately. 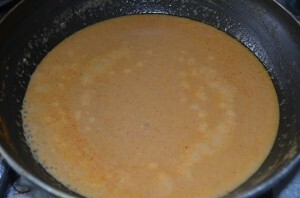 Add the koftas to the gravy 10 mins before serving, else it will absorb all the gravy & become very soggy. Remember we are adding salt & chilli powder in 2 stages. So add accordingly. 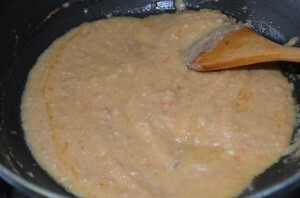 Corn flour is added to bind the raw banana mixture into a dough. 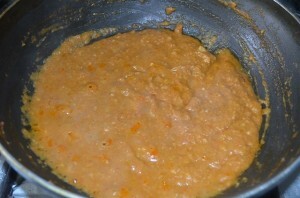 Do not add water to form the dough, else the koftas will split while frying. 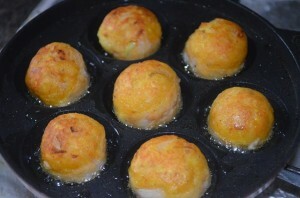 If u dont have a paniyaram pan, u can shallow/deep fry the koftas too. U can add fresh cream to the gravy too. 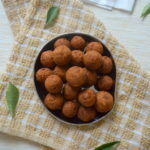 Sending this Raw Banana Kofta Curry recipe to May month’s challenge. Awesome, nobody would’ve guessed the ingredients, delicious kofta curry..
Oh boy, its raw banana kofta, fantastic job Sis, kofta curry looks absolutely stunning. I love raw banana kofta. Have never made it myself yet. Great recipe. Delicious kofta curry, nd gravy looks so yummy.. Fantastic kofta curry.perfect colour n koftas. totally yummy. G’day! 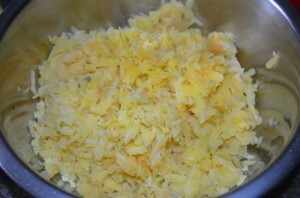 I love your recipe and am inspired by your step by step photos! Congrats on completing this month’s challenge too!